This framed family name sign is available in many different colors. You choose the family name you would like on the sign, the inspirational saying, the color of the family name, and the color of the frame. You can customize this framed family name sign to match your house. The wood framed sign measures 13″ x 42″ and has a keyhole cut in the back so it’s ready to hang directly on the wall. PERSONALIZED FRAMED FAMILY NAME SIGN-Family Portrait Wall “Thank you for the beautiful Family Name Sign! I was looking for ‘just the right thing’ to include in the new family portrait wall of our home. Your beautiful sign is the central point of the wall. Every person who has been through our front door has commented on the workmanship and beauty of your sign! Seeing our family name and motto amongst our cherished photos generates a feeling of pride in our family. I’m so glad I found your Family Name Sign. It is a wonderful, unique creation! 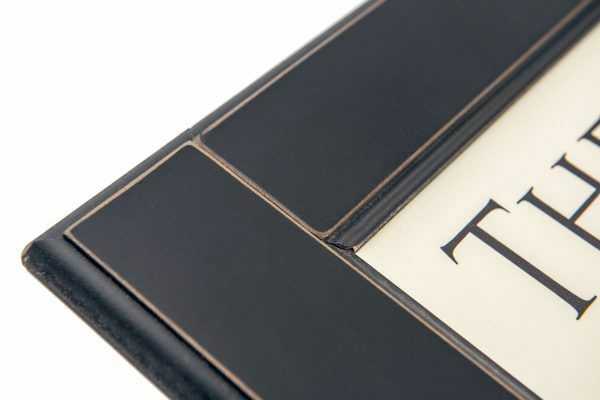 -Vanessa” We often get comments from our customers telling us how much they love their Framed Family Name Sign. The reactions that we get are similar to this one from our customer Vanessa. At American Woodcrafts we provide you with a “wonderful, unique creation” that you will be proud to display on the wall of your home. Your guests will notice the beautiful work of art on your wall as well. This wood framed sign is made with top quality workmanship for a beautiful enduring quality. Since we never use vinyl lettering on our signs, you can expect the lettering to last a lifetime. It is a great size to be the focal point of your wall. Frame measures 13″ x 42″ and is ready to hang directly on the wall with the built-in keyhole hanger. This personalized wood framed sign can be customized with your family last name and an inspirational saying of your choice. This sign features the saying “May this home be filled with love and laughter” which is an American Woodcrafts original saying. This sign looks great in a grouping of family photos like Vanessa had. It also looks great in a kitchen, family room, or any room of the house. You choose the black or chocolate frame color for your sign. You also choose the name color for your sign. This sign features the family name in tan but you can also get the family name in red, sage, charcoal or even custom colors. Our signs are uniquely designed to look great with any type of home decor. If your home decor style is primitive, country, traditional, shabby chic, contemporary or more formal, this sign will look great. Personalized family name signs make wonderful wedding gifts, bridal shower gifts, anniversary gifts, and Christmas gifts. Many of our customers call to tell us that their personalized gift was the hit of the party. Everyone likes to see their name in print. It truly does “generate a feeling of pride” in people as our customer Vanessa pointed out.